I believe we are among the most blessed people on the planet to live in British Columbia. All we need is a government that’s working every day for the people who live here. Common Ground: Counting down to a provincial election BC is awash in attack ads and you’ve got a bull’s eye on you. How do you respond? John Horgan: You’ve hit the nail on the head. BC Liberals are spending $20m of taxpayers’ money and not talking about things that matter to people, about the services neglected for 16 years. For example, services for seniors. Nine out of 10 care homes don’t have resources for minimum staffing levels. That strikes me as a failure. Nine hundred people died from opioid-related overdoses last year, also a failure. Yet the government is taking our public wealth and promoting themselves. On top of that, we’ve got the most well-funded corporate party ever in BC. The Liberals rake in enormous amounts of money from the corporate sector and we’ve been asking over the past 10 years to get big money out of politics. Case in point: the creators of feel-good advertisements, the Pace Group, got $23 million in government contracts as they were donating to the BC Liberals. To me, an obvious conflict, but not to the premier. CG: With few opportunities for debate and the legislature, basically part-time, would you like a leadership debate? JH: I believe it’s being negotiated now. The more important issue is our democracy and institutions; it was 200 days between sittings. Last fall, there were cobwebs in the legislature, rather than people representing BC communities. But the Liberals prefer to make decisions behind closed doors in a clandestine way and claim only they have answers to our problems. Whenever a government believes only they know best, that’s the time to throw them to the curb. CG: Are fear-mongering attack ads really just the voice of the wealthiest 10%? JH: My approach has been to let them throw the mud and hold the government accountable. If they think they’re getting a free ride, they’re sadly mistaken. I’m going to talk about yesterday and, more importantly, what are we going to do tomorrow? CG: This is a very important election with a deeply divided electorate, along traditional right/left lines, rural vs. urban, between environmentalists and people who stress jobs, millennials and seniors. How will you bridge these? JH: You’ve identified the challenge. I’m a born-and-raised British Columbian, had good fortune as an MLA for over a decade, to criss-cross BC, talking to people about the environment and economy. Everyone recognizes you can’t separate the two. If you don’t have an environment, you won’t have an economy. And you need to make sure that economy is working for everybody, not just the select few. That means ensuring, for example, forestry, a foundational BC industry. I worked in the Ocean Falls pulp mill many years ago, helped pay for my education with a good-paying job. There’s 150 fewer mills today than in 2001; 30,000 fewer people working in the forests, and we’ve never exported more raw logs than we did last November. And we’re not seeing re-planting and silviculture we expect from the tenure-holders. We should be demanding this, as the public stewards of our land and resources, for this and future generations. 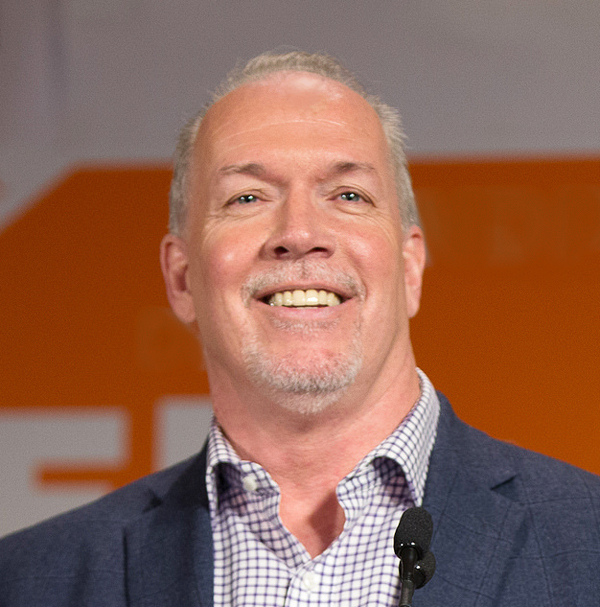 CG: How have BC NDP governments handled the economy better than the Liberals? JH: We left two balanced budgets to the Liberals and they immediately slashed taxes for the wealthy and corporations, increased medical services premiums (MSPs), claiming that was going to somehow trickle down to the rest of us. Of course, it didn’t work that way. They ran massive deficits for a number of years and declared victory. My responsibility is to lead the NDP and discuss what people are talking to me about, like childcare. People tell me over and over that young families are looking for services to help them participate fully in the economy. So $10-a-day childcare is not a perk or a nicety. It’s a necessity for many families, especially women. They have anxiety about the patchwork they must set up: their parents, Monday and Tuesday, Aunt Harriet and Uncle Bill, Wednesdays, figuring out how to keep going. The BC Business Council and the Vancouver Board of Trade support accelerating childcare. It’s good for kids, parents and the economy. The Liberals say ‘you’re on your own,’ we’re going to take care of our friends, the rest of you, make do. CG: What about a $15/hr minimum wage? JH: There are people working two and three jobs to make ends meet and the premier is working one job and getting two salaries, as premier, and as a Liberal party fundraiser. Most people are struggling and I believe the least we can do is give a pay raise to those who are paid the least in the most expensive jurisdiction in Canada. The premier wants us to think she’s benevolent. But we need a methodical way to get to $15/hr, lead the country in wages, as we used to, so all wages go up, not just those at the very bottom. Wages have stagnated for a decade and BC is the worst place for young people to get ahead. The premier talks about statistics that fit her narrative, but the reality is when you’re flying around in a private jet, you’re not talking to people. I’m on the SkyTrain, on buses, in communities, meeting with people, answering questions and taking the heat. I’m hearing about the challenges people face. It’s time we had a government that was working for them, rather than wealthy donors. When low income individuals have more money in their pockets, they usually spend it. When they do, they don’t go out of town or leave the country. They spend it in the community, which stimulates small business development. We need a systematic approach, to talk to small business owners. The notion of a serving wage, for example. Not only restauranteurs – many of whom have given a million plus dollars to the Liberal party – benefit from a wage that’s even more minimal. I was a waiter, worked for tips and was happy to get them. But I believe a minimum wage should be for everybody and it’s what we intend to do. CG: We’ve benefited from extracting resources, but there’s a new consciousness that we should be caring for these, as well. Where are the new jobs and how will you stimulate them? JH: NDP tax credits for the film industry in the 1990s led to a critical mass that’s second to none. That’s how the economy grows. It doesn’t happen with the wave of a wand. It happens over time. Whenever a government is taking credit for everything that’s going on, the chances are pretty good they’re doing that because they haven’t had any impact at all. In rural BC, on our resource front, we have less revenue from forestry, mining and natural gas than from MSPs in the last budget. That tells me our traditional industries are in decline. Jobs are being created largely in the Lower Mainland, and south Island, skilled jobs in high tech, information technology, green jobs and building the new economy. That’s an area the Liberals ignore. That sector is growing despite the BC Liberals, not because of them. We’re developing technologies to store energy for longer periods. Once you create electricity, you have to move it somewhere. The advantage we’ve had historically is our reservoir system, in the Columbia and the Peace, we’ve been able to use these as large batteries. Living in a rainforest is advantageous. But as climate changes, we’re seeing different weather patterns, not as much snowfall (hard to believe after the winter we’ve had). With less snowpack, a thoughtful government would ask, ‘How can we supplement our water hydro-based system with technologies not dependent on water?’ The BC Liberals, in their haste to bring on private power, focused on run-of-river projects. They called them small, but some were 250/300 megawatts. Not small; that’s a dam. I’m not averse to the technology, never have been, if appropriately located with minimal impact. No impact on fish, with an existing logging road in some cases, already a good fall, so you have the run to create energy. The better course of action, augmenting our hydro system, are alternatives like solar, wind and geothermal. Interestingly, Dr. Harry Swain, chair of the federal-provincial joint review panel on environmental, economic, and First Nations impacts of largest public works, in his report on the Site C dam, said Hydro has a responsibility to look at geothermal. Yet there hasn’t been a penny invested. In the Chilcotin and other parts of BC, we have a tremendous untapped geothermal resource. And wind and solar power – other alternatives – to complement our existing sources. But the Liberals have been short-sighted in this regard. CG: We’re in an affordability crisis with too many homeless. What can be done? JH: Housing is a broad affordability challenge, the whole continuum of finding single occupancy opportunities for individuals in distress. Families are living in one bedroom apartments, with a second or third child on the way and no prospects. There’s nowhere for them to go because housing costs are absolutely out of control. In 2014, when I became leader and appointed David Eby as housing spokesperson, he went like a terror and said, ‘Look at what’s happening around us. We see speculative investments and headlines: “Get Out of Gold and Get into Condominiums in Vancouver.”’ When housing stock becomes a commodity, you’ve got a problem. It’s a fundamental right, not a speculative investment, in my world anyway, and for the vast BC majority. Housing is a safe place to be, to keep out of the elements and grow your family and life. That’s not how the BC Liberals look at it. When we raised these issues in the legislature, highlighting the extraordinary explosion in the cost of single family homes in Vancouver, the response from the BC Liberals was to laugh it off and say, ‘You don’t like people having equity.’ It has nothing to do with that. People are being priced out of the market and the development community, building condos to sell, rather than units to rent. The federal government’s been out of the housing business for some 20 years now. Mr. Trudeau made a commitment to get back into it, a great opportunity for a new government led by me to reinvigorate the co-op movement in BC. People living in co-ops are absolutely delighted to be in a safe and affordable environment, with pride of ownership, without all the money to get in. CG: People, worried about keeping their apartment, now open their Hydro and ICBC bills and can’t afford ferries, but hear about surpluses and balanced budgets. JH: At what cost? The social deficit created by BC Liberals has to be put up against their so-called surpluses. They’ve been taking money out of our Crown corporations at an unsustainable pace, borrowing money when the companies are actually losing money, and then putting that into these deferral accounts – $6 billion by the end of this term in deferred debt, to be paid by ratepayers. Before the last election, Christy Clark and Rich Coleman said they had wrestled Hydro to the ground, fired a few people and rates weren’t going up. They cancelled the rate hearing and BC utility process. When re-elected: in the first five years, 28% rate increases and much more to come. At the same time, they were taking an increased dividend from the Crown corporation, even though it was losing money. We have more energy than we need, demand is declining. We used to export to the US at a handsome profit, playing the markets. Now, the US is awash in electricity. So we’ve got nowhere to sell it and more than we need. The average price of electricity in 2006 was $35/megawatt hour. The average price today is the same. Yet we’ve been buying new supply at $100, $110, $120/mwh and building Site C at a conservatively estimated $90/mwh. You can’t buy high and sell low forever; it’s falling on us and on our families. Liberals said they were gonna fix it, then shut the legislature. When your landlord just bumped up your rent and you look at your Hydro bill, that’s how homelessness happens. It’s critically important to look at the entire continuum of housing, not just those who are currently homeless, but also those on the edge of homelessness, what used to be called middle class. This inequality in our society is the biggest challenge that the new government will have, and, in fact, it’s the biggest challenge British Columbia has. CG: What about the people who need treatment, but have fallen through the cracks? JH: Mental health and addictions are rampant all over BC. The fentanyl crisis has highlighted to people in smaller communities that this is not just an urban problem. It’s a societal problem to be addressed. For example, I’m excited about revitalizing Riverview in the Tri-cities – Coquitlam, Port Coquitlam, Port Moody – not as a place to keep or warehouse people, but as a sanctuary for those who want and hope to break addictions. The best way is to have resources available for front-line workers. I’m making an announcement: a new ministry of mental health and addictions. It’s critically important that there be champions inside government. As a public servant, I know the challenges that government faces and the silos that emerge within the system. But a champion for a cause, whether it’s childcare or mental health and addictions, is someone that’s working within government to make sure the pockets of cash that exist are consolidated towards delivering services for people. NDP candidate Selina Robinson from Coquitlam is a family therapist and front-line worker – an example from our team. Riverview lands are an outstanding opportunity for a place of wellness to build support systems out into communities. When it closed, there was nothing to receive those who left. We need to reverse that, not as a warehouse, but as a place of wellness, healing and hope for vulnerable people, every day. CG: Would a Premier Horgan submit Site C to the utilities process? JH: Yes. It’s the only major project since the Utilities Commission was created that has not gone through the approval process. CG: What about opening the books on BC Hydro, ICBC, BC Ferries? Are you going to review these with an eye to serving people? JH: That’s a significant part of our platform and why I’m grinning like the Cheshire cat at those three Crowns particularly, fundamentally. Almost 800,000 people live in ferry-dependent coastal communities. I’ve forgotten more about this than the Liberals know. They don’t understand ferries, that’s why they do so poorly on Vancouver Island. The ferry system is an extension of our highway system. So, yes, we’re going to look at those three major Crowns – ICBC, BC Hydro and BC Ferries – with a magnifying glass and find a better way forward that has people at the centre. CG: Christy Clark ignored recommendations of her expert panel on a climate change plan. How will you proceed? JH: I met with panel members and was delighted with space for increasing the carbon price after 2018, a new government’s opportunity to look at existing programs, see how we can tweak them, whether that’s low emission vehicles or how to give people tools to reduce their footprint. That one-year hiatus gives me some space to have a real conversation, rather than a knee-jerk reaction, and time to hear all about their conclusions. The task force wasn’t just passionate climate action people. Municipal leaders, advocates, industry leaders, the LNG Alliance, were also at the table, a bunch of people, horse-trading, to find a way forward. It disappointed me when a 2020 target was just thrown away. One assumes that, okay, let’s move to the 2030 target, but that was just thrown away, as well. The premier rested on reducing our emissions by 2050. That matters to my children and grandchildren. But I want to see action today. Experts made it clear that carbon taxes are a valuable tool, but not the only one. The only measure of success is a reduction of emissions. If you have and meet targets, it doesn’t matter how high your carbon price goes; it just becomes a tax. We’ve reintroduced a 2030 target. The feds came up with their own strategy of a national carbon price, good news for Canada and for BC because we’re already ahead of the game. They’ve set a price of $50/ton by the year 2020. Our carbon pricing plan focuses on taxing the polluters, creating the largest emissions and giving tools to people who don’t have the wealth of large emitters to reduce their own footprint. The first government in Canada to legislate climate action plan was Joan Sawicki’s BC NDP plan in 1999 – the only government to table a climate action plan following the Kyoto Accords. I’m passionate about climate action. In over 50 years on the planet, I’ve seen and felt the changes. I was cutting our lawn, taking advantage of a beautiful mid-November day. My oldest son reminded me we live in a rainforest, that climate is changing and that I got elected to do something about it. I’m dedicated to do what I can, if fortunate to win the election, to make substantive changes and leave a planet that’s healthy. Instead of just giving tax breaks to people, I want to give money back to people so they can change their own behaviour and everything that’s surplus to that will be driven into new technologies, to transit investments, to programs that will reduce emissions. That’s the standard we should be measured by. The creation of the Agricultural Land Reserve by the NDP Barrett government is the most forward-looking policy I can recollect as a history student and proud BC citizen. It’s endured multiple different governments over time and has stood as a symbol of what we can and should do with our arable land. I look at the First Nation in my community, the Sooke Nation. They’ve opened my eyes to alternative energy prospects with photovoltaic solar panels on all of their common buildings. They’re meeting their needs, selling back to BC Hydro, powering their greenhouses and growing wasabi for export. They’re also doing shellfish aquaculture in the Sooke Basin with oysters on top of scallops, on top of sea cucumbers, a modest footprint. Food production is through the roof, protein being created by First Nations, with energy from the sun, in the middle of a rainforest. Imagine what we could do in Osoyoos or Penticton or Kamloops where we have arable land and abundant sun? As climate change continues, our imported food sources, Mexico and California, become less viable. It will be more important than ever to protect our arable land and put it to good use, not just growing hay. I got into government with Mike Harcourt when the Treaty Commission had just begun. I have a masters degree in history and I’ve looked at Canadian history up and down and all ways to Sunday. Harcourt’s commitment to the treaty process really excited me at the start of the ‘90s. I worked with Mike on a range of files, but was passionate about the treaty process as the way forward. In 25 years, successive court rulings have made it abundantly clear: rights and title aren’t just theoretical. I’m excited about the certainty it gives us. To invest in BC, on a land base, talk to First Nations about how to do it. CG: Electoral reform is needed for a healthy and fair democracy. Are you committed to proportional representation? JH: I spent years in opposition, without any influence on policy even though the government of the day received less than 50% of votes while the opposition side had the majority of votes, but zero influence on outcome. So in 2009, I voted in favour of STV. It was defeated, but perfection is the enemy of progress. Let’s make progress. Whatever this is, it has got to be better. I believe we are among the most blessed people on the planet, to live in British Columbia. All we need is a government that’s working every day for the people who live here, rather than the people that write the cheques. I think that day is just around the corner and a New Democrat government, led by me, will have people at the centre of it. This man is very special. BC would be lucky to have him as premier.